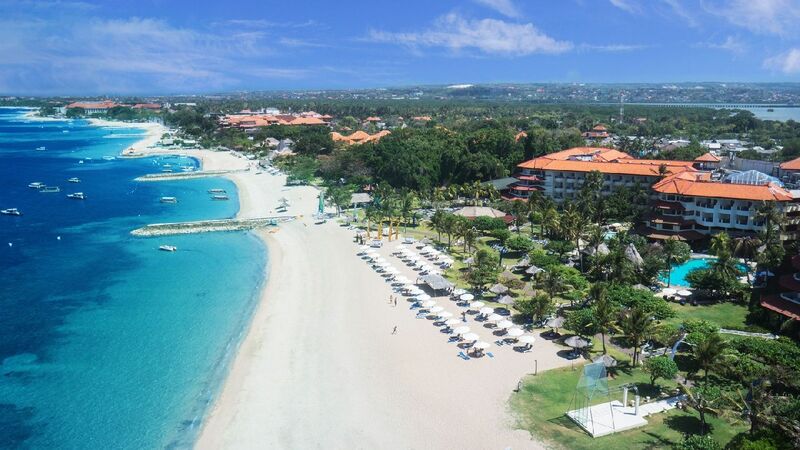 Set on the southern part of Bali, Tanjung Benoa – Nusa Dua resort area, Grand Mirage Resort and Thalasso Bali is blessed with a hypnotizing view of Indian Ocean. This beach hotel in Bali is 25 minutes away from Ngurah Rai International Airport. With its pristine private beach, this 5 star beachfront Bali resort offers wonderful experiences of spending leisure time in a luxury hotel. 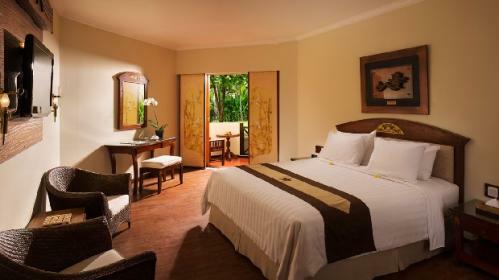 Grand Mirage Resort and Thalasso Bali Hotel features 301 impressive rooms and suites. 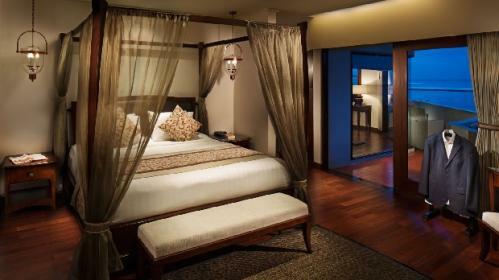 Sumptuously appointed with artistic furniture, this luxury Bali resort articulates the identity of the Island of God. The spectacular view of Mirage gardens or the Indian Ocean from the balcony serves unsurpassed serenity to the feeling. Featuring 4 food and beverage outlets, the executive chef brings his worldwide cuisine experiences into the dishes. Inviting entertainments and exquisite nibbles from Asia, Europe, and Australia are being served in theme night dinner. Called as a family friendly resort, Grand Mirage featureskids club and children pool. The warm Mirage activity team arranges various children activities to develop the creativity. With all the luxury inclusions, the Nusa Dua hotel is definitely worth listing on every Bali itinerary! This room measures 42 square meters and includes a comforting queen bed or twin single beds swathed with fine linens, well appointed with Balinese furniture, and a luxurious array of amenities. Equipped with a casual but elegant chair and table, the private balcony is an impeccable point to unwind while sipping a cup of morning tea. Garden View or Ocean View (based on availability). King or Two Queens (by bed type request, no guarantee). This spacious 80 square metre suite features a comfortable sitting area and an ample balcony with hypnotizing ocean views. Appointed with twin queen beds or one king bed and well-curated Balinese furniture, this majestic suite radiates an unconditional serenity of the Island of Gods. This suite includes a TV, desk & chair, mini-bar, coffee maker and private balcony.